Christmas is in 6 days, and while nearly half of the country is currently covered in snow thanks to last week's massive winter storm , warm air is set to melt away any dreams of a white Christmas. Parts of the Northwest United States are set to receive a fresh coating of snow early this week that will likely stick around until the holiday. 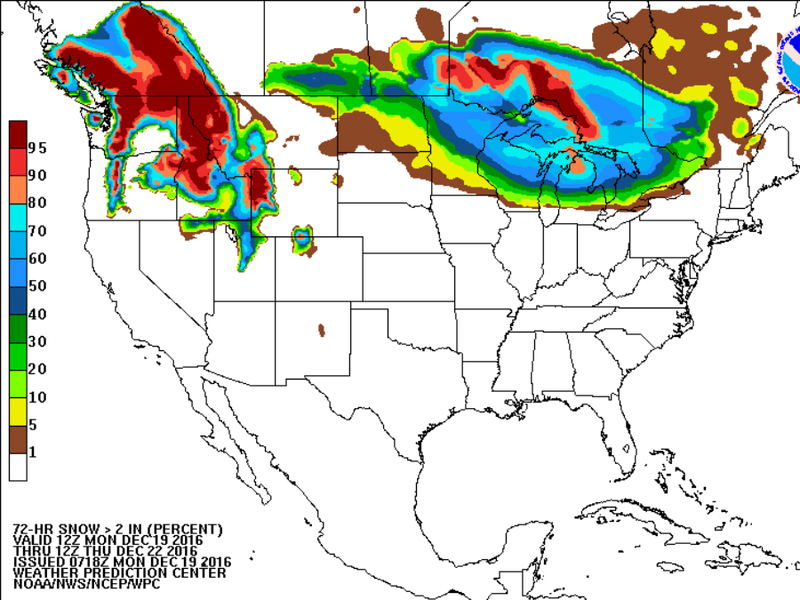 Near the middle of this week, parts of the Northern Plains and Upper Midwest will get a light coat of snow. That same system is going to bring some snow to the Northeast just days before Christmas. While the northern United States is getting some fresh, fluffy snow, the rest of the country will finally begin to thaw out, and as a result, melt some of the snow that's fallen in the past week. 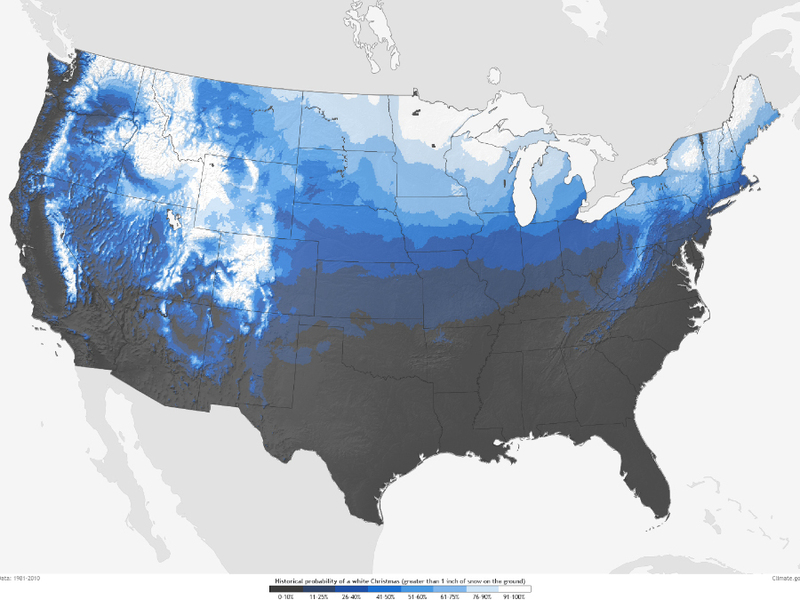 The "Historical Probability of a White Christmas" map from the National Oceanic and Atmospheric Administration is available online now, and shows most of the Lower 48 states have less than a 10 percent chance of snow on Dec. 25. In other words, if you want that White Christmas you'll either have to head to the Rockies in the West or the Northern Plains and Upper Midwest. These spots also happen to be the places where you historically have a near 100 percent chance of seeing snow on Christmas every year. As of right now, forecast models are putting a strong storm system centered over Nebraska on Christmas day, which is expected to bring wind, snowy conditions to the Northern Plains and Upper Midwest while wind and rain hit the Southern Plains and the rest of the Midwest on the holiday. If it makes you feel any better, it's an elaborate process for a single snowflake to form, let alone for many snowflakes to pile up any day of the year, let alone Christmas.